The romantically-named Yo-Ho Barrel Aged Barley Wine B-12 from Yo-Ho Brewing is a sherry cask-aged barley wine. It’s apparently one in a series (as the name would suggest), and at 11.5% will definitely knock your socks off. Look at that label and tell me it doesn’t look like Robo. This is so special it comes in its own box. It’s a 2013 vintage, and was one of those beers I mentioned drunkenly to Rob that I wanted to drink- me then instantly forgetting about it and him skipping home to order it off Rakuten, squirrel it away in his Beer Vault and add its value to my ever increasing beer tab. (Which he does pay off – Rob) He then sprung it on me as a delightful Christmas present and informed me I had less than two weeks before it went bad. I nodded sagely and then promptly forgot it again on my way home. Beer and I were eventually reunited, however, and that brings us to this fateful night where I finally open the bugger. As soon as this opens- with a powerful carbon fart- I can smell it. The cap has a special plastic stopper, I assume to stop it flying into orbit during its three-year aging. There’s a decent amount of head for a vintage- more than much younger beers I’ve had recently. The nose is heavy with malt, dried raisins, dates and apricots. Down the hatch it goes, and there’s a strong alcohol taste- obviously attributable to the whisky barrel aging process, as well as it being a barley wine. It’s quite bitter, despite it being aged for three years. I’ve recently had a year-old Baird Ganko Oyaji and a two year old Stone Guardian, and both of those have been relatively smooth compared to this. The dried fruit lingers, and it’s accompanied by a distinct walnut aftertaste. It’s also surprisingly strongly carbonated. Yo-Ho Brewing have clearly pulled out all the stops to make this an excellent aged beer. The bottle itself is basically a 1/3 scale champagne bottle, all the better to avoid bottle bombs. Yo-Ho Barrel Aged Barley Wine Codename Agent B-12 (maybe not its real name) is an exceptional barrel-aged beer. It’s bitter, strong and nutty, like a good coffee or a Vietnam vet. If you can find it- remember, it’s the beer with Robo from Chrono Trigger on the label- then, well, it’ll probably be out of date. But that’s not going to stop you, is it? Yo-Ho Barrel Aged Barley Wine B-12 was a limited edition run of only 300 bottles that was released in November 2015. Yo-Ho do release different varieties annually so it’s best to keep an eye out for it around mid-November. I have to admit, I was skeptical at first, if not confused as well. 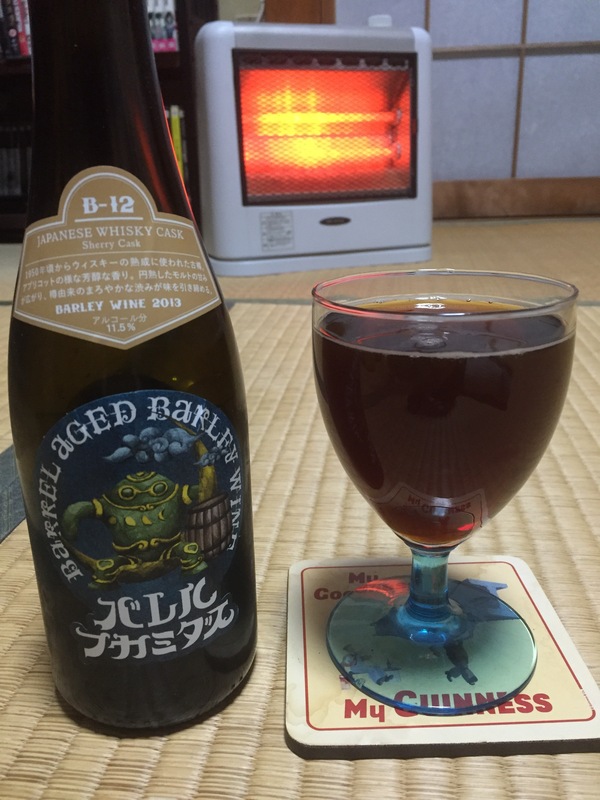 Yo-Ho Barrel Aged Barley Wine B-12 really did have a splendid balance between barleywine caramel silkiness and a sharp sherry taste to it in the follow up – the kind of warming feeling you get from a nice glass of whiskey or sherry. The bitterness was present but I found it to be more mellow than Joe did though the high carbonation compared to other barleywines was noticeable. I would love to drink more of this but it’s a massive disappointment Yo-Ho limited the production of it. One paragraph, perhaps. I sometimes wish these abridged reviews were at the start, instead of at the end. Haha! You’ll notice a few variants of that subheading- one line, one paragraph and occasionally “Joe’s angry rant” if it’s particularly bad!